Our Lady J on the set of "Transparent"
Last year, Jill Soloway created Transparent, a show about a transgender man’s transition to woman. The show’s set was a place where all were welcome. Soloway has spoken openly about her “transfirmative action program,” under which she gives preferential treatment to transgender people when hiring for the show. Over the course of the first season, more than 80 transgender people worked on the show as an actor, extra, or crewmember. The only place lacking a transgender voice was the writers’ room. Enter Our Lady J, one of Soloway’s most notable hires for season two, which premieres December 4. She is a classically-trained pianist, singer, and songwriter who also appeared on Logo TV’s RuPaul’s Drag Race. While “television writer” may have been missing from her impressive resume, she has a lifetime of knowledge and a desire to tell honest stories about the transgender community. 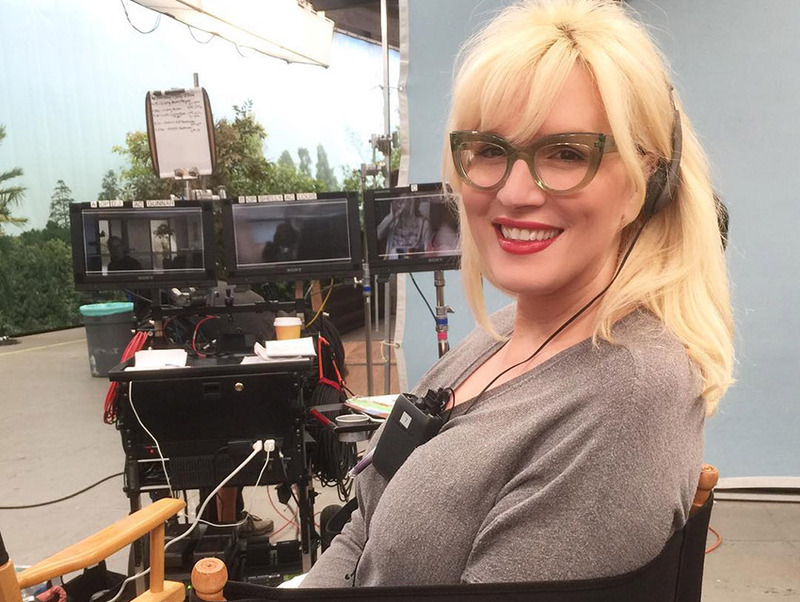 We recently caught up with Our Lady J to discuss season two, learning to write for television, and why Soloway’s approach to Transparent is so important. You were invited to join the writing team for season two. How did that come about? Jill and I met at the GLAAD Awards about a year and a half ago, and she was telling me about the show. The pilot was about to come out, and she mentioned that she had a part that I might be good for, which was the part of Davina. I actually auditioned for Davina and did not get the job. However, I felt that Jill contained all sorts of magic. I just stayed close, and there was an opening for a job as a writer. I applied for the job and ended up getting it. What was it like learning to write for television? Jill held a workshop for trans writers before she offered me the position. And in that workshop, there were six of us. We all submitted short stories to get into this workshop. And then we learned how to write for television in a week. We created a writers’ room, and we wrote a pilot in that week. So, I had a crash course in screenwriting before I started at Transparent, and then with season two, it’s been pretty much all on-the-job learning. We’ve just begun writing season three. What effect has Jill’s “transfirmative action” approach had? “Transfirmative action” is what brought me into the writers’ room. She realized that she needed a trans person in the writers’ room instead of just bringing in trans consultants. But Jill’s a bit of punk anyways—in the best possible way. She wants to bring more trans people into Hollywood in general, so the writers’ workshop was an attempt to give trans people the tools to be screenwriters and be working in Hollywood. Everyone had the opportunity to join the Writers Guild after that workshop. Transparent is a model of bringing trans people up to speed in a world that has had their doors closed to trans people. Initially, people criticized Jill’s decision to hire a trans person because they believed that being transgender was no guarantee that someone would be able to write about the trans experience for television. How do you respond to that? What do you think you’ve brought to the show this season? Trans people have been otherized and marginalized for centuries, if not millennia, although we’ve been around since the beginning of time. Our stories have yet to be told by us in the medium of film and television. I think the argument is that anyone can write for any kind of character because that’s what writers are about. I should be able to write for a cisgender character, and a cis writer should be able to write for a trans character. But in actuality, there really need to be trans writers to educate other writers about the trans experience before that experience is brought into world for all to know. Right now all we’re getting are stories that further marginalize us, and a lot of them are false trans cliches. I think what I’ve brought into the writers’ room is a more honest approach to trans narrative in all of the trans characters on the show—not just Maura, but Maura’s friends. I can’t imagine how that would be possible for a cis person to do given the miseducation and misrepresentation of trans people so far. What was your impression of season one? Were there things that you wanted to change or improve upon in season two? I wanted to dig deeper into the trans lives—into a place that’s more messy and more human. In season one, Maura was represented so beautifully, but I felt like she was protected in a sense. The rest of the Pfeffermans are complete messes. And it’s like, where is Maura’s mess? So, we bring that into season two. We humanize her quite a bit. My thing is, if you have a show about people who are all behaving a certain way, the trans character should be behaving that way as well.. That’s how we know if we’re treating our trans characters fairly enough, if we’re treating them exactly like we’re treating cis people. Right. Jill has said that season one was about educating people so that season two could explore Maura as a character that, like her children, has flaws. Absolutely. The flaws she carried from before transitioning and in her transition, and what installed those flaws. A lot of it has to do with her living in the closet for so long, so the repercussions of not living an honest and authentic life—how do we make peace with that? When we transition, when I transitioned, it was with the intent to be honest with myself and with everyone around me. And there’s a lot of catching up to do, emotionally and psychologically, when that happens. What are some of the biggest changes this season? We’re stretching the definition of comedy in season two. It’s definitely more of a dramedy. Things get tough for the kids. Things get tough for Maura. Everyone goes through a lot of changes. I don’t know how much more I can tell you. As the only transgender writer on the show, did you feel a lot of pressure to represent the community? Yeah. I feel responsibility. It’s an important moment in history for trans people where we’re getting to be recognized, and I want to make sure that we get it right. And based on what I’ve seen of season two, I think we got it right.